SOLD – 6920 150th Ave N, Clearwater, FL 33764-listed by Deborah Ward, Keller Williams Realty – SOLD! SOLD! Call Deborah Ward & Associates at 727-216-9247 for information about this sale – or for other similar properties. What a find! 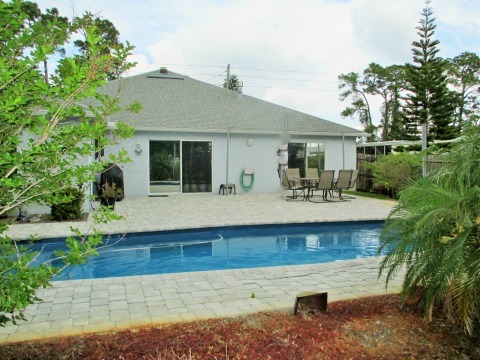 This 4 bedroom newer construction pool home has it all! Tucked away on a quiet street, this spacious modern house enjoys over a 1/3 of an acre of private Florida living at its best. From the great curb appeal, to the private sparkling pool, this one check off all the boxes. The moment you enter the home, you’ll enjoy the soaring ceilings, the airy and bright great room, and the view to the tropical patio and pool. The kitchen is a chef’s delight and features clever storage choices and opens to the living room-dining room combination – perfect for entertaining. The double-sided fireplace adds a coveted focal point and the angular ceiling is a real conversation piece. The private master suite also enjoys the gas fireplace along with a luxurious private bathroom complete with a garden tub and walk-in shower. The generous guest bedrooms share the second bathroom which also doubles as the pool bath. The new A/C system, saltless water softener system and oversize storage shed complete the package. Don’t delay in seeing this one – it will sell fast!